Have you ever looked into the mirror and imagine yourself with a different hairstyle? Although not many realize the importance of hairstyle, it’s wrong to underestimate the influence it has on our overall look. Though many are very precise when it comes to their dressing and makeup style, many tend to overlook a fitting hairstyle. Some others choose to “play it safe” with the same hairstyle, even for many years. Unfortunately, this may not be the right move. You certainly don’t want to go for hairstyles that age you, do you? 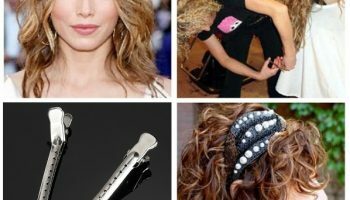 If so, check out these hairstyle mistakes you need to stay away from! Bobs can look very conservative especially when the hair is colored in black, they give a certain seriousness to the person and can make all their wrinkles be more noticeable. The thing is that a hair in layers looks much lighter and gives you a certain youthfulness, also short hairstyles with nice cuts are a good option when it comes to wanting to look younger. Long bob is a perfect alternative if you’d like something short and practical, yet not dated. However, don’t stick to a boring, styleless long bob. Instead of center-parting, go for long bob with side-swept bangs and add a bit of volume by curling the edges. It will soften your features and make your face look smaller. Whether you’re rocking long hair or short one, do not add volume only at the bottom of your hair, since it will make your face look wider. Curl your hair evenly from the top to the bottom for a youthful look. If your hair happens to be a long one, put away your hair straightener and say hello to wavy locks! 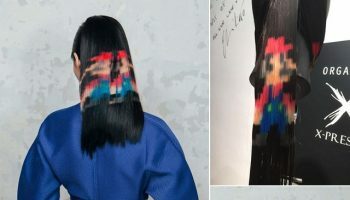 Super rigid hair? We get it, stiff and unmovable hair is the trend back in the 90’s. Bad news is, we’re in the 2000’s! 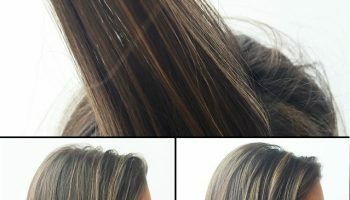 The use of a lot of styling products can give a lot of weight to the hair and this way it will stuck to the head, not to mention that some hairsprays can take away the natural shine of the hair and without shine, it looks old. Even when styled, limit the use of your hairspray. It will keep your hair natural-looking, and much healthier in the long run. If possible, use styling foam before styling your hair for a hairdo that lasts longer. Stay away from products categorized as “strong”, “ultra” or “firm”. Bleaching hair in time will create sensitivity and bleaching also dries out the hair and a healthy and young hair is always shiny. When a hair is dried the shine is missing. Also, choosing a certain color can make you look older, for example platinum blonde highlights wrinkles. Usually, lighter colors make a person look much younger when a dark color just highlights your dark circles under the eyes and every other imperfections you might have. If you are a big fan of black, dark brown or everything from that range of colors, you can still wear them but soften the harshness with some ombre effects. One thing you should be doing is by not sticking to one color. 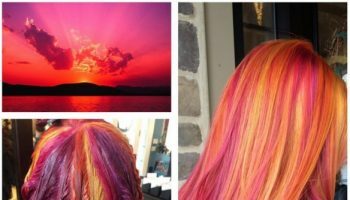 Balayage, ombre, somber; these are all hair dye variations that you can try out. You don’t have to go with bold, pastel colors to look young. Stay away from extremely dark black, but at the same time, choose a hair dye that matches your skin complexion. For fair skin, add a bit of brown or caramel to add contrast. Hair that’s very dry and dehydrated looks like it’s dead so this makes you be much closer to looking older. You should always use nourishing products on your hair like serums, hair masks and conditioners. Try to also get products with as less sulfate content as possible. If you can avoid using a drier, straightening and curling irons, that would be awesome for the health of your own hair. Going for a party? Watch out for how you do your hair. French twist is a classic hairstyle sought after by many women, but you don’t have to go for it. 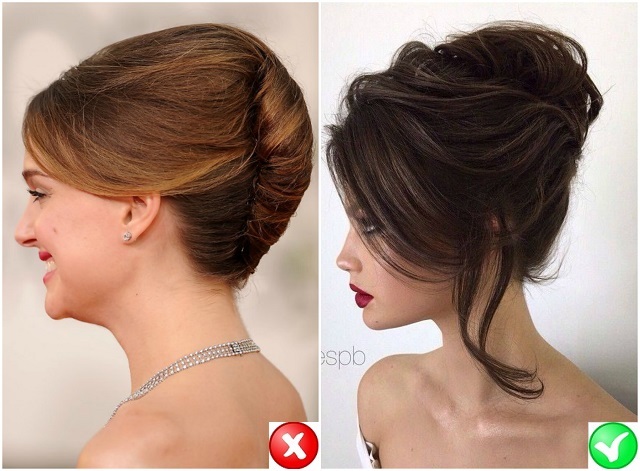 Instead, you may save yourself a few years by going for a simpler updo. Small curls’ era is also over, so why don’t you go for simpler, more natural curls? And instead of a tricky half-up ponytail, you can tie your hair in a ponytail, but leave some hair strands on the edges for a more elegant look. Marilyn Monroe rocked this hairstyle, but that’s a no-no if you’d like to look younger. Overly teased hair is easily associated to “retro”, but even if you are aiming for voluptuous hair, put away your teasing comb, and opt for round brush when blow-drying your hair. Extreme haircut does not guarantee you looking younger. Done wrong, it can ratchet up your age. Instead of overly-bold cut or color, go with something that best suits you. This tricky hairstyle may do you more harm than good, and there’s a strong reason why. When the bun is too small, you’re practically without hair; overexposing your face in the process. This will draw unnecessary attention on your fine lines and wrinkles, especially since your hair is not there to frame your face. Short hair may feel really good, especially when you live in tropical countries or if it’s summer time. However, make sure that you don’t cut your hair too short. Even if you’re a fan of short hair, go for slightly shaggy, layered cut that makes you look younger, instead of a conservative, blunt crop. Bonus point, maintenance would be much easier!